Putting things in Spanish doesn’t necessarily work, either: a last minute “¡Derecho!” is too easily confused with a similarly abrupt “¡Derecha!“. Even in their complete forms, “Sigue derecho” and “Gira a la derecha” don’t always come out with clear enough pronunciation to be interpreted correctly. 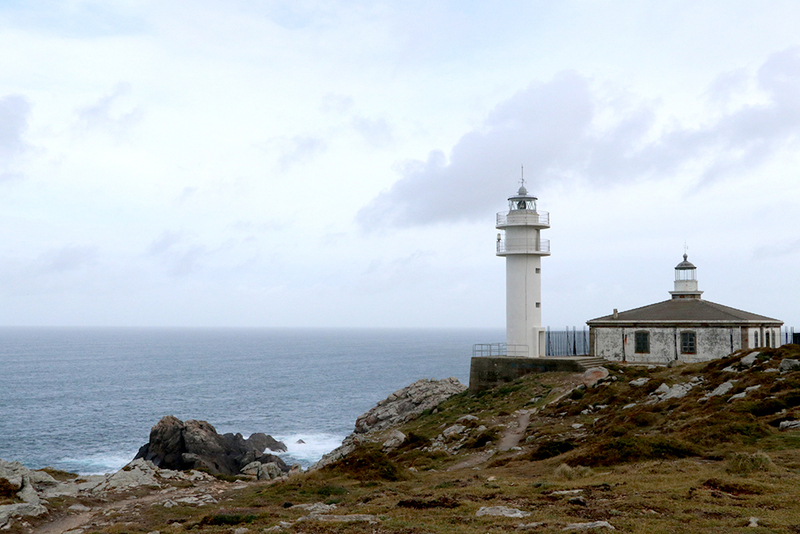 It was, therefore, not a completely relaxing break, but I did manage to navigate successfully enough to see all the faros I had on my list from A Coruña round the coast to Finisterre. And having taken pictures of all of them, I may as well go ahead and post them here. 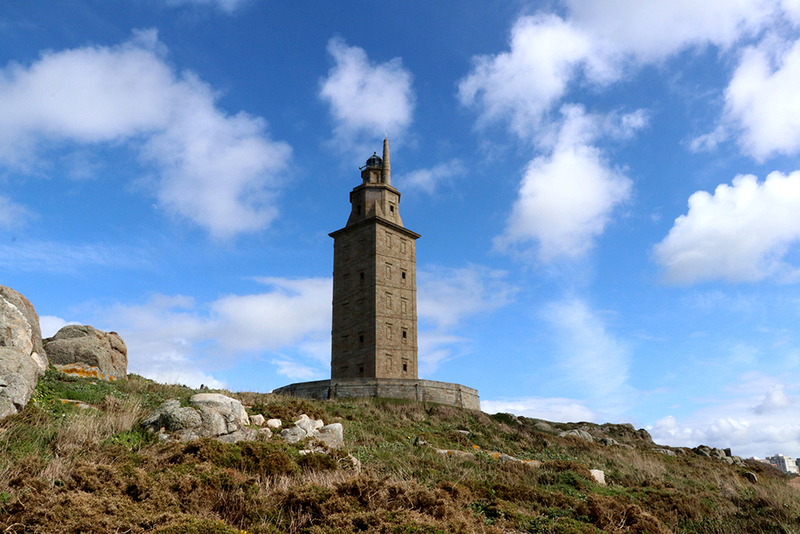 Firstly, the Tower of Hercules at A Coruña itself. 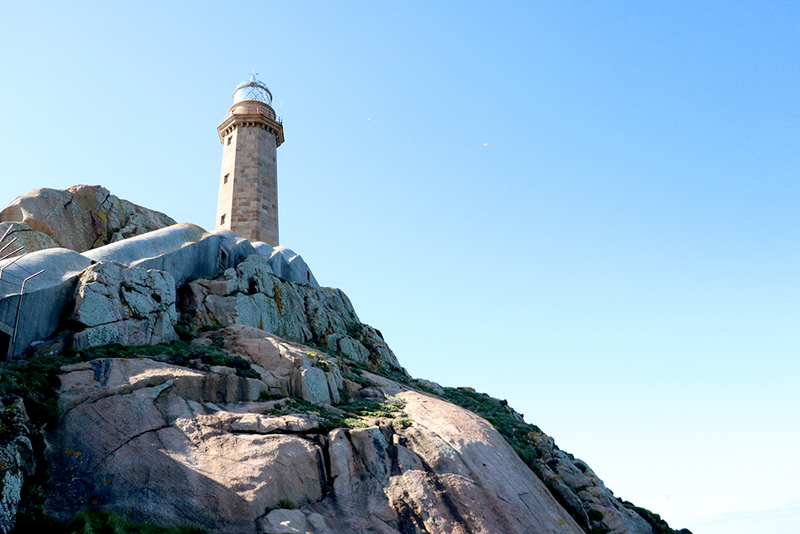 I’m not sure why it is called the Torre de Hércules, and not referred to specifically as a lighthouse. 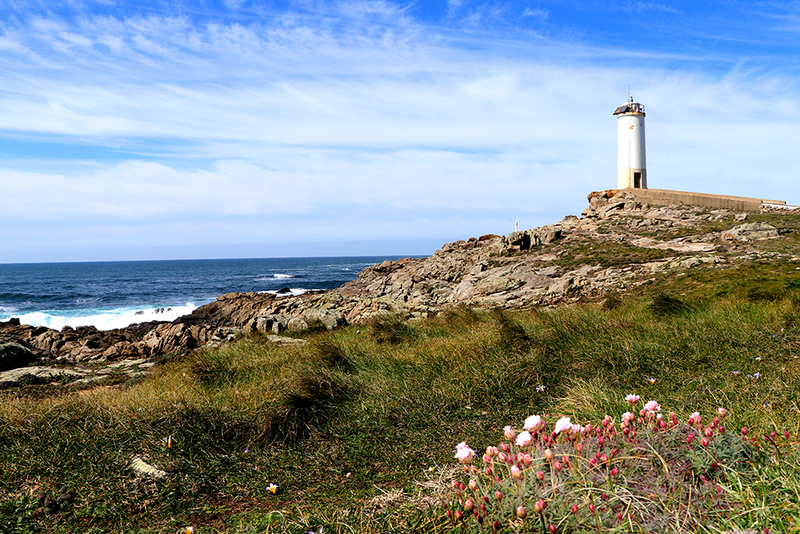 I thought the Malpica lighthouse was one of the most impressive ones I saw: it actually looked like a lighthouse. (The top photo of the post is a close up of the light.) The point is called Punta Nariga, probably because it sticks out like a nose. 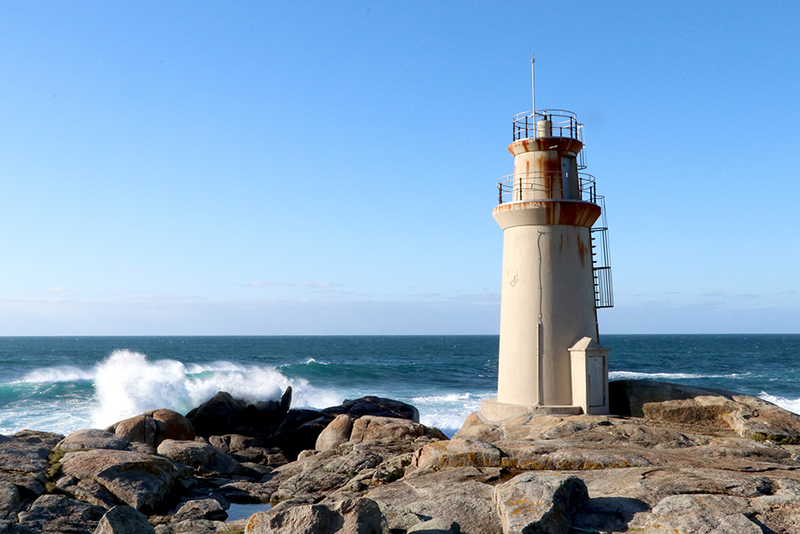 Moving on round the coast to the west, the next is the lighthouse at Cabo Roncudo. 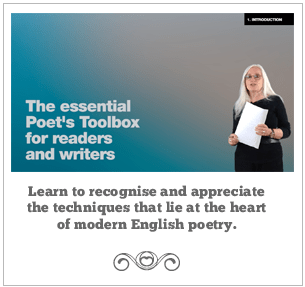 The Spanish verb roncar means “to snore”, but I don’t think there is any association with Point Nose, although they are only across the way from each other. 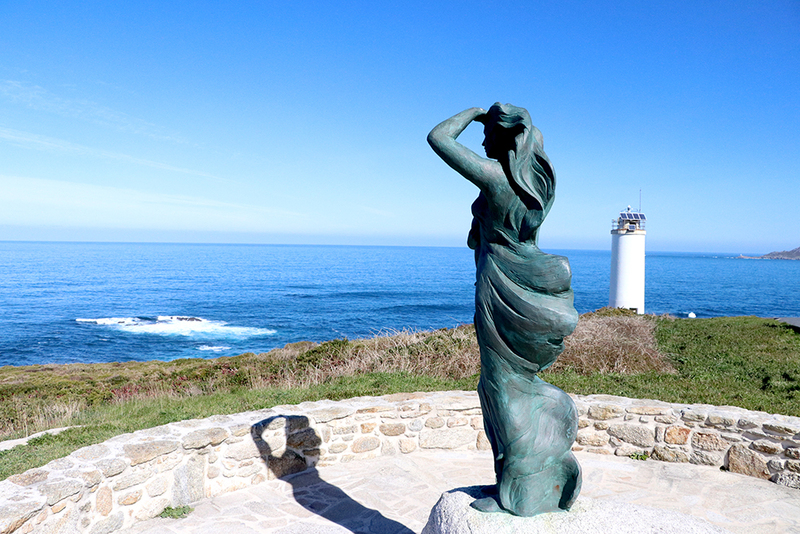 The lighthouse at Laxe is identical to the one at Cabo Roncudo, so to vary things a bit, here’s a photo of the statue A Espera with the faro in the background. In Spanish, the verb esperar means both “to hope” and “to wait”, either of which seems appropriate. 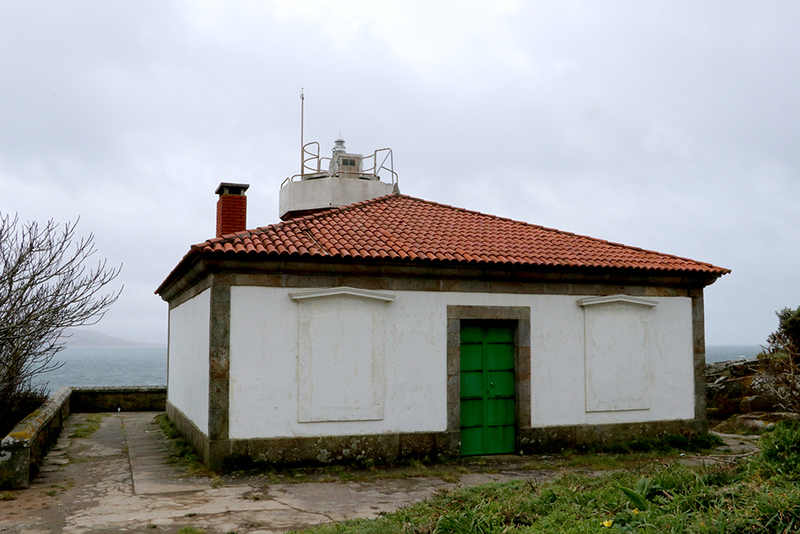 The next lighthouse is the faro at Cabo Vilán. I assume the grey concrete snake creeping up the rocks is a covered access to stop you getting blown away as you go up to the faro. 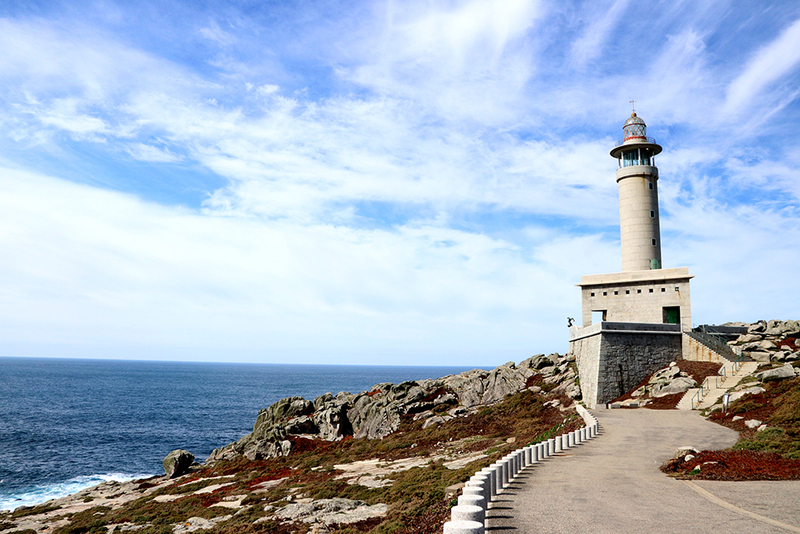 Punta de Barca is the lighthouse in Muxía, where the Virgin is said to have arrived in a boat of stone to encourage Santiago – the apostle James, son of Zebedee – to convert the land to Christianity. Despite not being the farthest point west, there are a couple of months each year where Touriñán is the place where the sun sets on continental Europe. I was there at the right time of year, but not at the right time of day. Anyway, I’m not sure there was actually enough sunshine to notice the sunset. 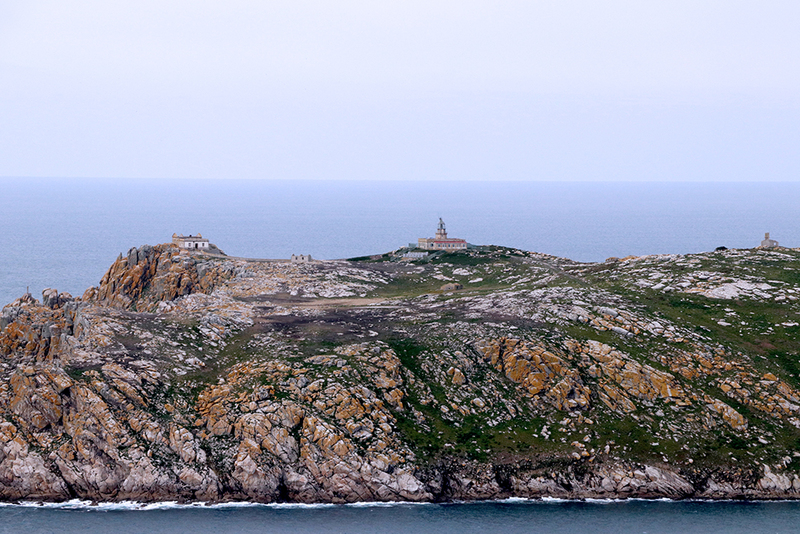 Fisterra – also known as Finisterre – means the end of the earth. 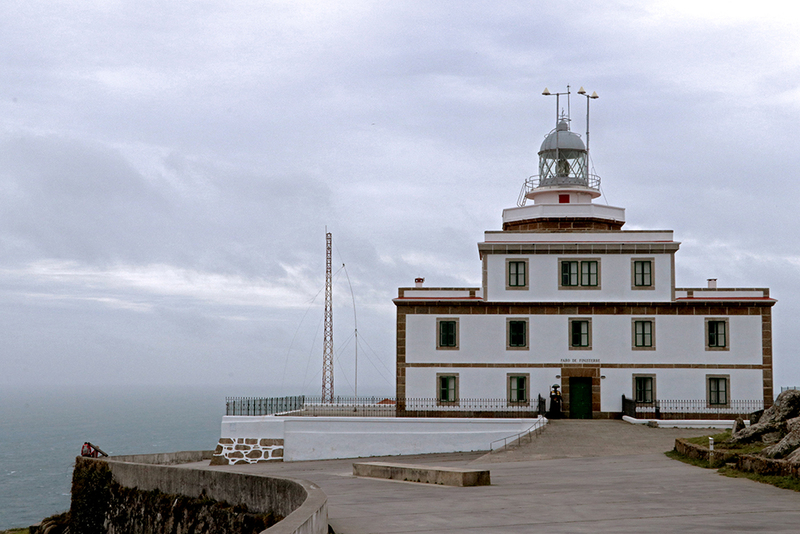 Despite its name suggesting remoteness, it was in fact the most commercialised of all the faros I visited. 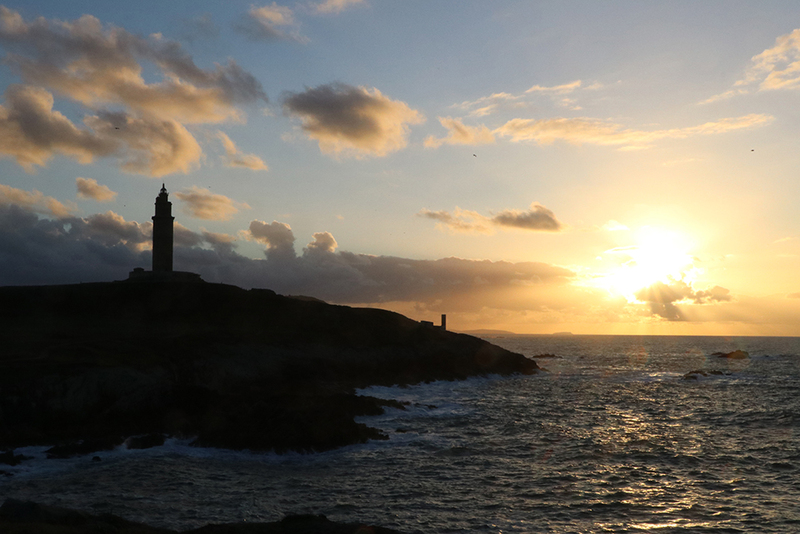 I think I’ve named them all correctly and put them in the right order, so I’ll just add one more picture to complete the set: back to la Torre de Hércules, this time at sunset. Hi Jacci. I was expecting it to be rather more like Wales, but should have realised the Costa da Morte would be an ideal wreckers’ coast.